A class of Prince George’s County recruit firefighters is taking lessons learned and taking it to heart. It appears that some of the current career recruits are learning more than basic firefighting and emergency medical technician skills. From donating blood to injured firefighters or researching and writing papers on cancer among firefighters, the members of Career Recruit School (CRS) #43 has always gone the extra mile in helping without being told or asked. Speaking of “going the extra mile” CRS #43 will run nearly 5 miles in a fund raising effort on Friday, June 10, 2011, 9:00 am. Recruit firefighters will be among a group that will run on the pedestrian area of the Woodrow Wilson Bridge to raise funds for the National Fallen Firefighters Foundation (NFFF). The funds raised from this effort will be presented to representatives of the NFFF including surviving families of fallen firefighters. Cathy Hedrick and surviving family members of Maryland Fallen Firefighter Mark Falkenhan will receive a check from CRS #43 on Monday, June 13, 2011, at the Fire/EMS Training Academy (FETA) in Cheltenham, MD. Cathy Hedrick will be teaching a class at the FETA on Monday and will be on hand to accept a check from CRS #43 with the Falkenhan family. The funds raised are expected to exceed $1,500. Cathy Hedrick began volunteering with the NFFF during the Memorial Weekend after her firefighter son, Kenny, was honored in 1993. Kenny was a member of the Morningside Volunteer Fire Department and suffered a Line of Duty Death while battling a house fire on Walls Lane in January of 1992. Anyone that is interested in donating funds to the efforts of Career Recruit School #43 may call the FETA at 301-856-3410. 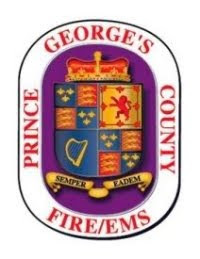 Recruit Firefighters will make the check presentation on Monday, June 13, 2011, at 11:00 am sharp, at the Prince George’s County Fire/EMS Training Academy, 9190 Commo Road, Cheltenham, MD, 20623. Media are welcome to attend. The American Red Cross, National Capital Region, and the Prince George’s County Fire/Emergency Medical Services Department will join forces to ensure citizens and residents are prepared for emergencies and how to prevent them. Several dozen Red Cross volunteers will be supported by career and volunteer firefighters as they deploy throughout communities going door-to-door providing literature on how to stay safe.